Thumbing through his local Swedish newspaper, Göteborg resident Mattias Akerberg found himself troubled by a full-page advertisement for Ikea. It wasn't that the Grevbäck bookcases looked any less sturdy, or that the Bibbi Snur duvet covers were any less colorful, or even that the names given to each of the company's 9,500 products were any less whimsical. No, what bothered Akerberg was the typeface. "I thought that something had gone terribly wrong, but when I Twittered about it, people at their ad agency told me that this was actually the new Ikea font," he recalls. "I could hardly believe it was true." Over its 60 years, Ikea has built a reputation as a purveyor of inexpensive but stylish home furnishings, selling everything from leather sofas to chrome toilet-bowl cleaners. Branding has been a large part of the Swedish chain's success  what urban dweller today, whether in Atlanta or Kuala Lumpur, doesn't recognize that bright blue warehouse, glowing like a beacon of fine living, at the side of the highway? And its signature typeface, a customized version of Futura, has long been an integral part of that brand. But with its 2010 catalogue now arriving in mailboxes, the supplier of headboards and coffee tables to the world's thrifty and trendy has switched to what it sees as a more functional typeface: Verdana. In the process, it has provoked an instantaneous global backlash, the kind that can only happen on the Internet. "Ikea, stop the Verdana madness!" pleaded Tokyo's Oliver Reichenstein on Twitter. "Words can't describe my disgust," spat Ben Cristensen of Melbourne. "Horrific," lamented Christian Hughes in Dublin. The online forum Typophile closed its first post on the subject with the words, "It's a sad day." 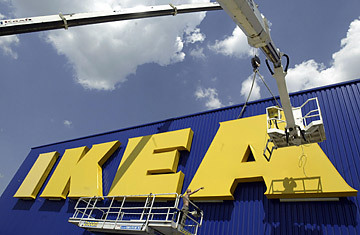 On Aug. 26, Romanian design consultant Marius Ursache started an online petition to get Ikea to change its mind. That night, Verdana was already a trending topic on Twitter, drawing more tweets than even Ted Kennedy. 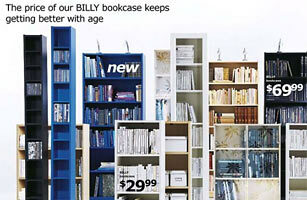 IKEA's 2009 online catalogue uses the old typeface. 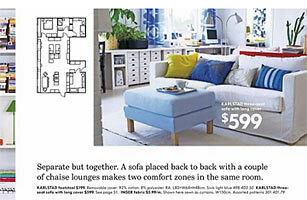 IKEA's 2010 online catalogue features the Verdana font. All this outrage over a font? For some designers, it's an issue of propriety  Verdana, which was invented by Microsoft, was intended to be used on a screen, not on paper. "It has open, wide letterforms with lots of space between characters to aid legibility at small sizes on screen," explains Simon l'Anson, creative director at Made by Many, a London-based digital-consulting company. "It doesn't exhibit any elegance or visual rhythm when set at large sizes. It's like taking the family sedan off-road. It will sort of work, but ultimately gets bogged down." Carolyn Fraser, a letterpress printer in Melbourne, Australia, adopts a different metaphor to explain the problem. "Verdana was designed for the limitations of the Web  it's dumbed down and overused. It's a bit like using Lego to build a skyscraper, when steel is clearly a superior choice." Others seem mystified by the choice to eliminate one of the chain's key identifying features. "The former typeface definitely better reflected Ikea's design philosophy, giving it a very special, unique flavor that actually fit the company's style," says Vitaly Friedman, editor in chief of the online Smashing Magazine, which is dedicated to Web design. "With Verdana being used all across the Web, Ikea's image not only loses originality, but also credibility and the reputation that the company has built since the 1940s." The main complaint that online protesters have, though, is that the newly adopted font is plain ugly. Especially when it's enlarged to, say, the size of a catalogue headline. Or worse yet, a billboard. So why would Ikea make such a change? The very ubiquity of Verdana seems to be part of the font's appeal. Freely distributed by Microsoft, the typeface allows Ikea to use the same font in all countries and with many alphabets. "It's more efficient and cost-effective," says Ikea spokeswoman Monika Gocic. "Plus, it's a simple, modern-looking typeface." "They went cheap, in other words," counters Bucharest designer Iancu Barbarasa, who blogged about the font change on his website. If he sounds somewhat bitter, there's a reason. With its attention to the curve of even a $9 lampshade, Ikea has become renowned for its understanding of good design. "Designers have always thought of Ikea as one of their own," Barbarasa notes. "So now, in a way, the design community feels betrayed." Indeed, the desire to remind people  and corporations  that design matters is what spurred design consultant Ursache to start a petition asking Ikea to do away with the offensive Verdana typeface. "Look, I know this isn't world hunger," he says. "But if a company like Ikea can make this mistake, you have to wonder who is going to lead when it comes to design." Ikea has yet to respond publicly to the tempest. "I think it's safe to say we were surprised by the response," admits spokeswoman Gocic. As of Aug. 27, Ursache's petition had garnered over 700 signatures. That may not seem like a lot, but then there weren't many protests at first to a certain beverage company's announcement in April 1985 that it would be changing its flagship product. Just three months later, however, New Coke was gone. And that was before Twitter.